The ILS Proton rocket launches from Russia's Baikonur Cosmodrome in Kazakhstan Oct. 14, 2012, carrying the Intelsat 23 satellite to orbit. PARIS — Satellite fleet operator Intelsat on Oct. 14 saw its faith in the recovery speed of Russia’s rocket industry validated with the successful launch of the Intelsat 23 satellite just two months after the same rocket failed, Intelsat and launch-services provider International Launch Services (ILS) said. The 2,700-kilogram IS-23, built by Orbital Sciences of Dulles, Va., was healthy in orbit after being separated from the rocket following launch from Russia's Baikonur Cosmodrome in Kazakhstan, Intelsat said. IS-23 is expected to operate for more than 18 years in geostationary orbit. Its first duty will be to replace the Intelsat 707 satellite at 307 degrees East. When measured in equivalents of 36 megahertz, a standard measure for satellite capacity, IS-23 carries 46 C-band and 34 Ku-band transponders. IS-23 is designed to provide communications links for data networks, energy production and corporate communications in the United States and Central and South America. The C-band coverage includes the western half of Africa, and most of Western Europe. The Ku-band coverage is focused on Latin America, which is one of the fastest-growing markets for satellite bandwidth. Perhaps the most striking element of the launch is that Washington- and Luxembourg-based Intelsat agreed to proceed with it so soon after the August failure of the Proton Breeze-M upper stage. 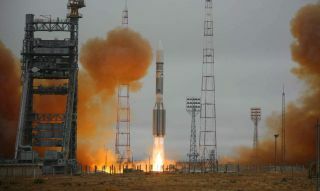 It has been common practice following previous Proton failures that a Russian government mission would be the customer on the return to flight. In this case, Intelsat and its insurance underwriters were sufficiently persuaded that Reston, Va.-based ILS and Proton prime contractor Khrunichev Space Center of Moscow had come to grips with the issue to agree to be the customer for the first flight after the failure.